Manufacturer: Kmart Corporation, of Troy, Mich. Hazard: The crocheted cherry-shape tassels and plastic buttons may pull off, posing a choking hazard to young children. Incidents/Injuries: The firm has received two reports of children pulling off the crocheted cherry-shape tassels. No injuries reported. 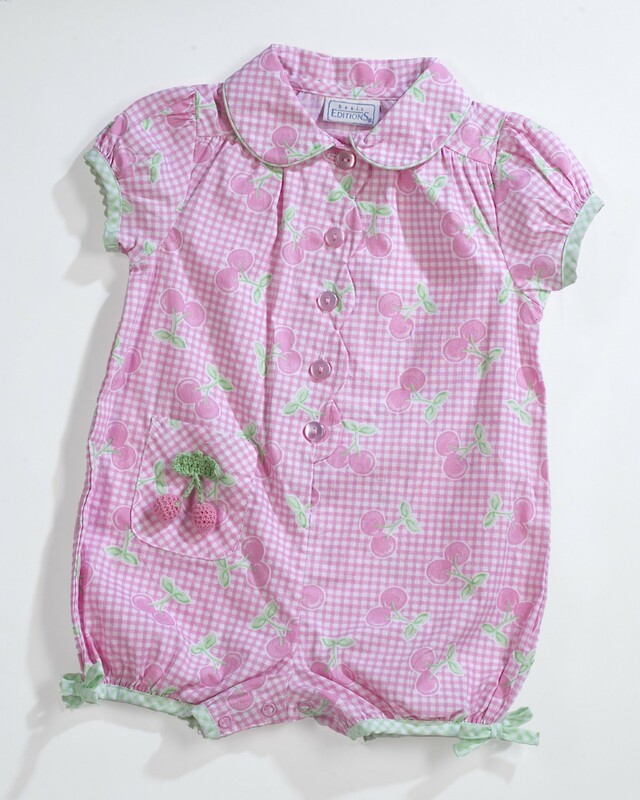 Description: The recalled rompers are pink and white gingham with pink buttons and crocheted cherry-shape tassels on the pocket and green and white gingham bows on the trim of the leg openings. The rompers were sold in infant sizes 12-months to 24-months and toddler sizes 2T to 5T. “MADE IN/HECHO EN BANGLADESH” and “basic EDITIONS®” is printed on a label inside the neck of the garment. Sold at: Exclusively at Kmart stores nationwide from February 2004 through May 2004 for about $8. Remedy: Consumers should return the rompers to the Kmart store where purchased for a refund.